For those of you who didn’t know, Apache Solr is an open source enterprise search platform used to easily create search engines which searches websites, files and databases. Its major features include powerful full-text search, faceted search, distributed search, hit highlighting and index replication. This article assumes you have at least basic knowledge of linux, know how to use the shell, and most importantly, you host your site on your own VPS. The installation is quite simple. I will show you through the step by step installation Apache Solr on CentOS 6. Step 3. 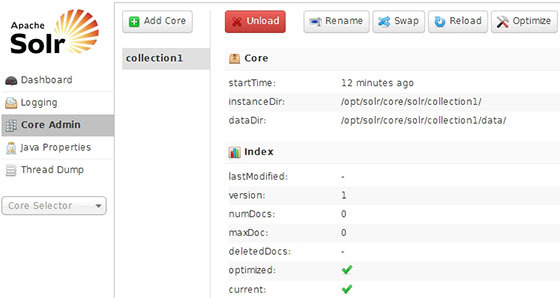 Create script for handling the Solr server service. echo"failed. See error code for more information." Step 4. Configure Iptables or Firewall. Step 5. Accessing Apache Solr. Apache Solr will be available on HTTP port 8983 by default. Open your favorite browser and navigate to http://yourdomain.com:8983/solr/ or http://server-ip:8983/solr/. Congratulation’s! You have successfully installed Apache Solr. Thanks for using this tutorial for installing Apache Solr on CentOS 6 system. Related Posts of "How To Install Apache Solr on CentOS 6"